Current Collection: Pantograph until 1933, replaced with trolleypole. Current Operation: 167 preserved at Crich, 168 became basis of Paddlesteamer 731, 170 formed basis of Frigate 736 and 174 now 734, the trailer from the Western Train. The Pantographs had the distinction of being the only trams (pre 1950's) in Blackpool to operate on the route that they were originally built for and never to operate a timetabled journey on any other route. They were built in 1928 for the North Station Route and operated this route all their lives until the final examples 170, 172 and 175 were withdrawn after Easter 1961. The Pantographs were distinctive by their high steps and flat fronts and large platforms, which made them look old before their time. Their grease filled pantograph trays were soon replaced with trolleys due to corrosion of the trays and grease being carried by other trams to other parts of the system and the neighbouring Lytham St Annes tramway. When the railcoaches arrived in 1933, the Pantographs were relegated to seasonal work and mainly short workings and specials on the route. Modernisation took place to make the pantographs look more like their more modern looking counterparts with railcoach style moquette and new destination screens being fitted. During the war, the Pantographs were painted in a mainly cream livery with a green band and sweeping 'V's at each end. 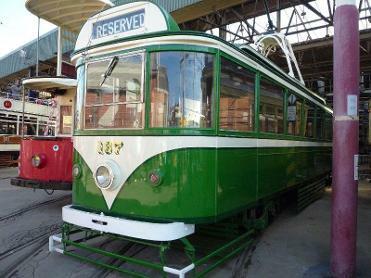 Meanwhile the other tramcars were painted in a mainly green livery with a white band and 'v'. However after the war the opposite happened with the Pantographs receiving the wartime livery and the other cars receiving a mainly cream livery. Following the war Pantographs also found use on the Fleetwood - Broadwater local service. This service was set up for locals in Broadwater who couldnt get on the busy service trams and specials full of holiday makers heading to the Fleetwood market. However the locals werent happy, they felt that they were being treated as 2nd class citizens as the service was run using the oldest cars in the fleet. In 1954, Pantograph 176 was scrapped following a failed passenger flow experiment which had been carried out using this car. All other cars received new bogies apart from 167 which was withdrawn for use as a works car. In 1962 the tram had been donated to Crich Tramway Village for preservation. 170 replaced 167 as the Works car. By 1960, most Pantograph Cars had been withdrawn, however, many of them were rebuilt as illuminated trams, 168 became the basis of the Paddlesteamer, 170 became the Frigate 'HMS Blackpool' following withdrawal as the works car in 1965, and 174 became the carrige of the Western Train, and its past as an Pantograph Car is evident as it still retains the shape and much of the original interior. The final Pantograph cars to run in passenger service were 172 and 175 which took their final bow at Easter 1961.